If you are looking for a unique and romantic jewelry piece to give your loved one, you will love this ornate diamond heart pendant slide from Apples of Gold Jewelry! The heart pendant measures 0.87 inch (22mm) in size, and is crafted from a beautiful 14K white gold. 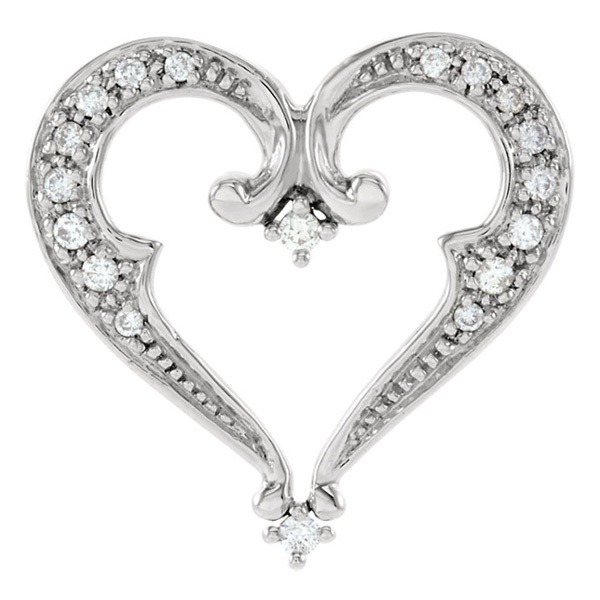 This ornate heart pendant is made even more special due to the diamonds that it features - eight on each side of the heart, one on the bottom on the point where the sides connect, and one in the center. This stunning pendant's ten diamonds total 0.20 carats (1/5 carat), and they are rated G-H for color and I1 for clarity. We guarantee our Ornate Diamond Heart Pendant Slide to be high quality, authentic jewelry, as described above.